Funny coincidence happened last week. I was rummaging through a resale store with my girl and we found some fairy wings that were just her size. She’s at the stage where she’s discovering that dress up is fun. She really had no idea what they were, but she knew she wanted them on. We drove back home and to our surprise found a screener copy of Walt Disney Picture’s newest “Disney Fairies” movie Tinker Bell and the Lost Treasure for us to watch and be able to tell you about it. Well, Camila had her first encounter ever with fairies. Now she knows what those wings are, and the funny thing is that every time she watches this DVD she has to have the wings on! How’s that for interactive? In this, Disney’s 2nd movie featuring one of their most beloved and well-known characters, Tinker Bell ventures out beyond Pixie Hollow in a secret mission to find the solution to a problem she created and that put her home in trouble. Tinker Bell and the Lost Treasure is this feisty fairy’s biggest adventure so far. Set during Autumn when the fairies are busy changing the colors of the leaves on human’s trees, helping geese fly south and tending to pumpkin patches, Tink is summoned by the Queen and entrusted with the important job of creating a magical scepter which will capture the light of a rare blue moon to create the needed reserves of pixie dust for Pixie Hollow. However, Tink’s temperament leads her to an accident she must repair by crossing the oceans into the unknown in a long and dangerous journey. Along the way she makes a new friend, Blaze, a sweet firefly who will be her guiding light. In the end, Tink learns about the value of friendship and of owning up to one’s own mistakes. The child in me still enjoys stories about fairies and this is one with a beautiful and magical scenery, a story of responsibility and no witches in sight. I’ll gladly let me girl feast on this one…with the Spanish language option on, of course! Starting today, all the little fairies in your life can be mesmerized with Tinker Bell’s new exciting adventure. 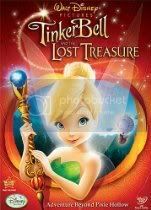 Tinker Bell and the Lost Treasure is now available as a “Combo Pack” (includes a Blu-ray + DVD) and as a DVD in standard definition. We invite you to visit our new sister site, SpanglishBabyFinds, where we review the coolest products made with Latino and/or bilingual kids in mind. This week we’ll be giving away Dora’s new movie and also a pack of Ice Age DVDs. Don’t miss out! Thanks for the review! You can also rent it at redbox for $1! I know what we will be doing for movie night this week!